– We’re a PA Forward Library! 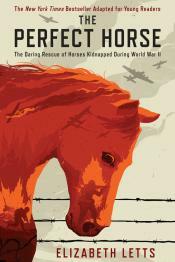 When a small troop of American soldiers capture a German spy, they uncover an unexpected secret: Hitler has kidnapped the world’s finest purebread horses and hidden them. But starving Russian troops are drawing closer and the horses face the danger of being slaughtered for food. With little time to spare, Colonel Hank Reed and his soldiers cross enemy lines to heroically save some of the worl’s most treasured animals. This entry was posted in New Children Books on April 9, 2019 by msbpl.